But I don't think that's right. When I go to a L'Ambroisie, yes, I order half portions, and a long menu, and it takes three hours. That was the case with some other patrons when I went there, but not the case with others (a similar example at L'Arpege is seeing a couple order a lobster and bottle of wine each, that's it). Contrast with Willows Inn - where everyone is seated at the same time (or a slight stagger), and dishes are precisely timed with all deviations being pre-planned. It's a wonderful meal, but one that has as singular primary purposes. It's not a great place for a business meeting, or a date, or a good place to tuck into a single plate of something both immaculate and comforting (unless you want a half portion, in which case they can do that). Or, if someone told you that you could only eat at L'Ambroisie or Brooklyn Fare, I think you'd probably choose Brooklyn Fare. Now, if someone said that you had to choose one or the other for three consecutive meals, I think that the choice may be different. I don't mean that as an implicit critique of the Brooklyn Fares, it's more that an SP style restaurant is built for a different purpose. Getting back to the REAL subject here: I still don't understand how Ian does all this. Nah, it’s not so mysterious. Kids were all old enough last year to be left with nanny/granny/aunt for occasional nights out/weekends away. And I was in NYC a few times with work (my wife flew over for a weekend once when we hit BF, EMP and SGO). 2019 will be quieter. back to me: i did write that tandoor chop house meal up. here. I walk by this restaurant on the way to/from work but haven't ever thought to go. 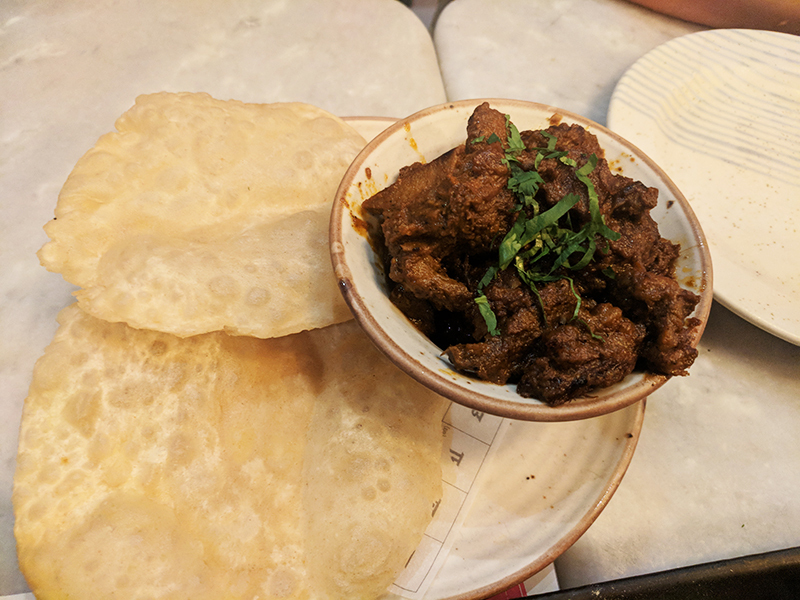 Partly due to Jay's review, partly due to liking the reliable/good value Dishoom nearby (their breakfast is surprisingly excellent, particularly the filled naans...) I will give it a go on your recommendation! for what it's worth, i liked my one meal at tandoor chop house far, far more than my one meal at dishoom. of course, it's a more limited palette at tandoor chop house. ian, did you give tandoor chop house a go yet? here is my final restaurant report from our london trip last june. 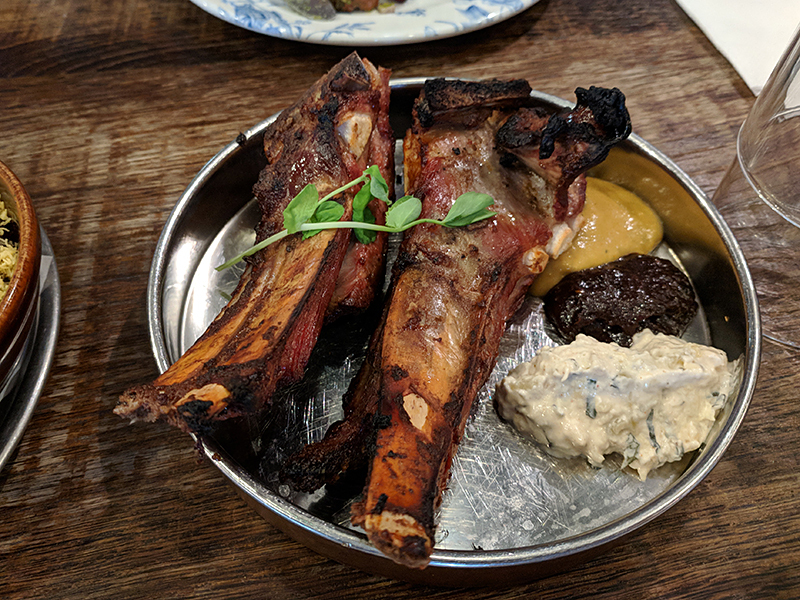 if tandoor chop house had not received glowing reviews from the local media, talli joe has and given the general high standards for mod'ish indian restaurants in london we were expecting to enjoy our meal there. it was our last meal of the trip eaten with the (indian) friends we stayed with for part of the trip, who are generally far less critical than me of most things. they were not impressed either. herewith the details which include more thoughts on the New Indian Exotica aesthetic. steve, you'll be interested to know that the kids both got butter chicken and liked it a lot. The Ledbury was quite wonderful. Great cooking there. But BRAT was our favorite meal and most enjoyable restaurant experience of our London stay. Bibendum (but the oyster bar for lunch) was only so-so. Both of those restaurants beat out St. John for food, this time around, though I did have some great hogget chops. The menu just wasn't that moving on the night we were there, and I missed out on one of the specials by not getting there earlier. Barrafina for a quick lunch was also quite good and plenty casual. Nobel Rot fine again. The Van Gogh spectacular at Tate Britain was spectacular. And your National Gallery is awesome...2 Vermeers worth the visit alone, but also a fabulous Boilly exhibit - and all those Rembrandts!